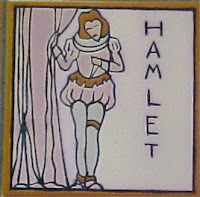 See Hamlet run. Run, Hamlet, Run. He is going to his mother's room. says Hamlet. ‘Uncle Claudius is bad. He gave my father poison. ‘Oh, there is Uncle Claudius,’ says Hamlet. ‘He is hiding behind the curtain. Why is he hiding behind the curtain? See Hamlet draw his sword. 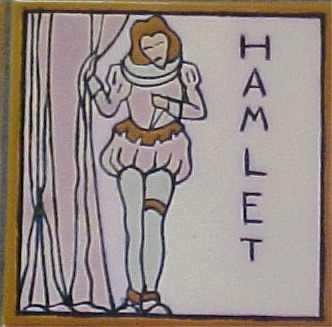 See Hamlet stab. Stab, Hamlet, stab. See Uncle Claudius' blood gushing. See Uncle Claudius fall. How funny he looks, stabbed. But it is not Uncle Claudius. It is Polonius. Polonius is Ophelia's father. But Hamlet's mother is not cross. She is a good mother. Hamlet loves his mother very much. Hamlet loves his mother very, very much. Does Hamlet love his mother a little too much? ‘I am on my way to find Uncle Claudius,’ Hamlet says. On the way he meets a man. ‘I am Laertes,’ says the man. See everybody wounded and bleeding and dying and dead. What fun they are having! Wouldn't you like to have fun like that?